We want to be your electrician for life. Therefore, it is our goal to always provide excellent electrical service to our customers, so you will refer us to your family and friends. Joe Eilhardt was born and raised locally in Sacramento County. He is married and has four children. Family and community are important so his company regularly supports local high schools and recreational soccer leagues. Joe has a BA in Computer Programming and holds all licenses and certifications with the State of California for a Residential/Commercial Journeyman Electrician. Joe studied for five years through the IBEW Local #340 apprenticeship program. After his graduation in May 1996, he worked for several commercial electrical contractors in Sacramento and El Dorado Counties. He was a foreman on several large new construction sites for PetCo, Old Navy and OSH hardware stores. He also worked on several State of California buildings downtown; as well as, PG&E power plants, hospital emergency back up systems, and street lights. 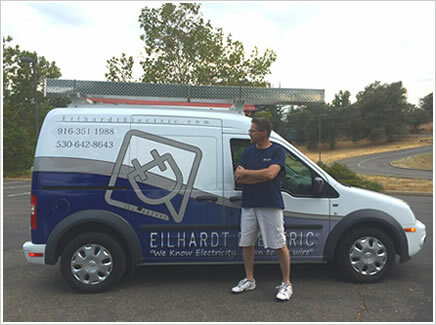 In 2003, Joe wanted to lead his own company to serve local customers well and formed EILHARDT ELECTRIC. Today, he continues to serve customers in the Sacramento and El Dorado Counties for their residential and commercial needs. Joe has earned the respect of many area local General Contractors and has loyal customers who repeat their business as well as refer him to friends and family. Eilhardt Electric returns all calls and has phone hours of 8 a.m to 5 p.m. Monday thru Friday. If you want to contact us out of hours, please use the contact us or the estimate request form.